The Zermatt Bergbahnen AG take visitors right to Europe’s highest mountain station – at amazing 3,883 metres. The panoramic view over the largest glaciers of the Alps and over no fewer than 38 breathtaking giants of the Swiss, French and Italian Alps is truly unparalleled. The Mont Blanc, highest mountain of the Alps, appears almost near enough to touch. Visitors are very close to Italian territory now and look at the “endearing rear” of the famous Matterhorn. Below them at the foot of the mountain, they can see Europe’s largest ski region, open 365 days a year. The time has come: This winter, the biggest construction project in the history of the Zermatt Bergbahnen AG will be completed – the 3S cableway (three-cable system). 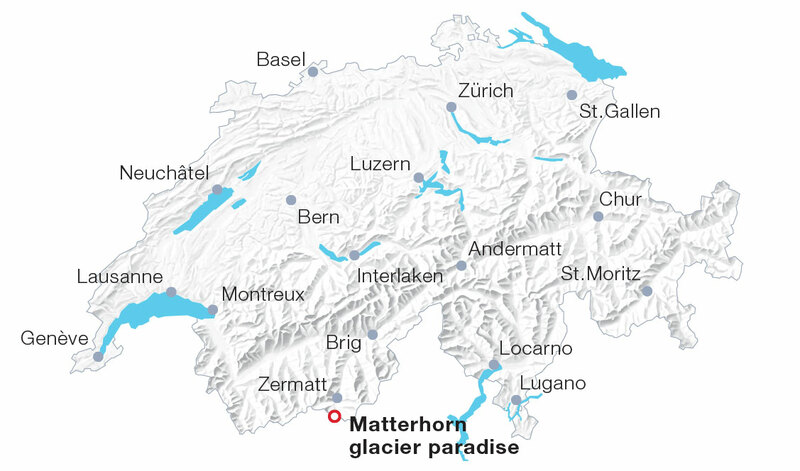 Every hour, up to 2,000 persons can be transported to the Matterhorn glacier paradise (Klein Matterhorn) – 365 days a year. The crown jewel of the new cableway, however, is the Crystal Ride. Four cabins have been embellished by thousands of sparkling Swarovski® crystals and also offer unexpected views downward. The ride in these crystal gondolas – unique in the whole world – comes at a surcharge of CHF 10. Attractions: The Crystal Ride cabins: when floating high above the glacier, the glass floor clears up, highest-altitude viewing platform in Europe, Cinema lounge with new thrilling film scenes focusing on Zermatt, available upon request: VIP cableway car with Moët Champagne between Zermatt and Trockener Steg, world’s highest glacier palace with ice sculptures and ice slide.